Wood dust is a combustible and respiratory hazard, meaning that dust collection is essential for the safety of workers. While many assume that OSHA standards primarily apply to large workshops, dust collection is required in wood shops ranging from large professional factories to small hobby shops. Ventilation, wood dust collection, and explosion prevention must be considered in any work area involving fine particulate wood dusts to meet standards and ensure the safety of the location, equipment, and workers. Wood dusts are both a combustible hazard and a respiratory hazard, which means that you must consider both the Minimum Explosible Concentration/Quantity (MEC/MEQ) and the Workplace Exposure Limit (WEL). Soft and green wood dusts have a WEL of about 5 micrograms per cubic meter. Your dust collection system must be able to keep dust below that level by removing dust at the source, at a rate comparable with the production output of dust. Most wood dusts are also classed as ST 2 dusts, meaning that they have a Kst rating between 200 and 300, which means that they are moderately explosible and can be set off by electrostatic energy. 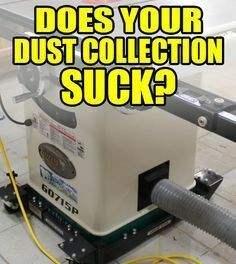 Your dust collection system should be able to handle dusts of this type. This typically means installing vents and hoods at the site of dust production, so that wood dusts are collected before they are spread into the air. Local dust collection, such as exhaust hoods or conveyors, removes dust quickly as it is produced, which can prevent dusts from reaching ignition points and escaping into the surrounding area. While the conveying air velocity required for your dust collection system will vary depending on the size of the system, the volume of air, and the weight and size of the wood particulate produced, you can start out with a base rate of 3,500-4,000 cubic feet per minute. However, your air pressure should be calculated based on your building, dust production, number of exhaust vents, and the length of any ducts or pipes. The air pressure must be able to lift particulate and move it to the collection area without losing dust at joints and vents. Stored wood dust is as much of a hazard as wood dust in a shop, so it is crucial that dust is stored correctly. NFPA regulations require that combustible dusts be stored outside of the building, or in a storage container with sufficient explosion relief venting. Filters should be purchased based on the micron size of the wood dust created. This will vary depending on the cutting or processing applications, and may vary from under 10 microns to sizes in millimeters. Dust filters should be of the right efficiency to trap the finest dust produced in the workplace. Pipes, ducts, and valves are crucial to maintaining the safety of a wood dust collection system. Ducts should be kept short, should not leak at the seams, and should be easy to take apart in order to allow for regular maintenance. Most dust collection systems will miss anywhere from 1 to 15% of fine dust particulate, depending on the size, quality of the installation, and the suitability of the system. This means that proper housekeeping is essential to keeping dust under the Minimum Explosible Concentration (MEC). Establish a regular housekeeping program to vacuum or sweep wood dust, and create a system for checking in hard to reach or hard to see areas, such as overhead lighting, between roofing panels, etc to ensure this. Wood dust can last for over a year, and even small quantities built up over time can eventually become explosible. A wood dust collection system can ensure the safety of a workshop or location, but only if it continues to perform at the same level. If additional workers, equipment, or new woodworking or cutting techniques are brought into the shop, the entire system should be adjusted to ensure that it continues remove dust before it becomes a hazard.